The Reichstag building (where the German parliament meets) is located in the district of Tiergarten, Berlin. The way the building looks now is due to several renovations, and especially the work of British architect Norman Foster in the 90's. The dome was added during the remodeling to light and ventilate the plenary hall, located just below it. Inside, two spiral ramps allow you to go up and down to the spectacular viewpoint. 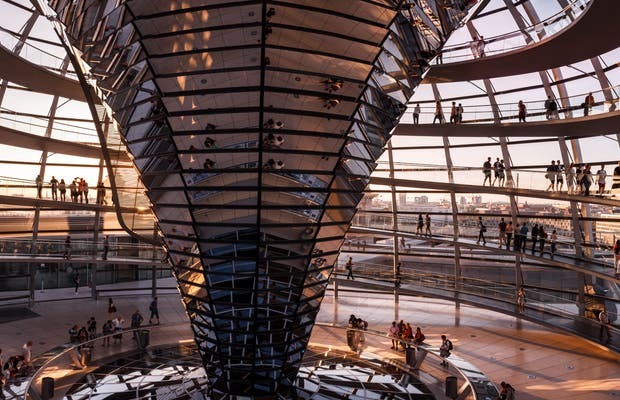 To visit the Reichstag building, you'll have to use the recently established advance booking system, which is the only way to get tickets to visit the Bundestag. Visiting hours at the dome are from 8:00 to 23:00 (last entry), with entry every 15 minutes. A visit here is essential. You make an appointment via e-mail: 'http://www.bundestag.de.' There are different visiting hours throughout the day (08:00 to 22:00). I saw it at night and although it was beautiful to see the city lights, I think it is advisable to visit in daylight. Not only is there the possibility to see where German politicians meet but it is impressive to see the architectural project created by Sir Norman Foster. Its showpiece is a spherical glass dome that lets you see the whole city from the top.